​House Wife accentuates the iron as a household object that has been associated with domesticity for years. The Iron is one of the many household objects that was advertised exclusively to women upon its distribution and continues to be today. By warping the iconic image of an iron in plaster I am highlighting how modern women are still trapped by a patriarchal society that claims to be equal. The recognizable nature of the object exemplifies that years of struggling for improvement isn’t enough to fix the core root of the problem. 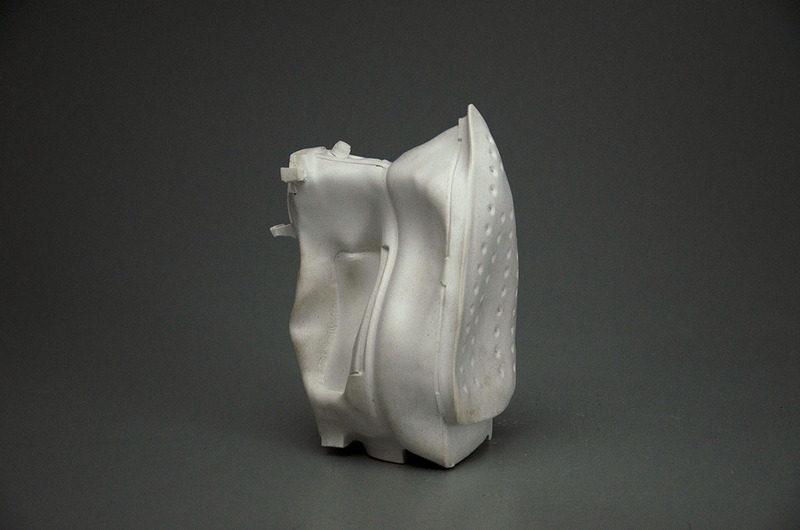 House Wife; Plaster; 5" x 7" x 9"
​Jacqueline Fischer grew up on Long Island where she spent most of her time by the ocean where she was fascinated by the patterns the currents left behind. As years went by Long Island’s population grew leaving it difficult for her to find time alone. This lead her to transfer to Alfred University where she is approaching her final year in the School of Art and Design. Seduced by her love of geology she takes any opportunity she can to travel in search of new and interesting rock formations throughout the country. It’s no surprise she found herself a sculptor primarily using ceramics and cast metal.